We take Intel’s latest and greatest CPU, the 10-core 20-thread i9-7900X, through our gauntlet of tests, as we get to grips with a new platform, X299. Shaving off $700 from the original 10-core desktop CPU, the i7-6950X, Intel offers more than just a simple clock boost to keep it competitive, such as with the inclusion of AVX512. When is a Core i7 not a Core i7? 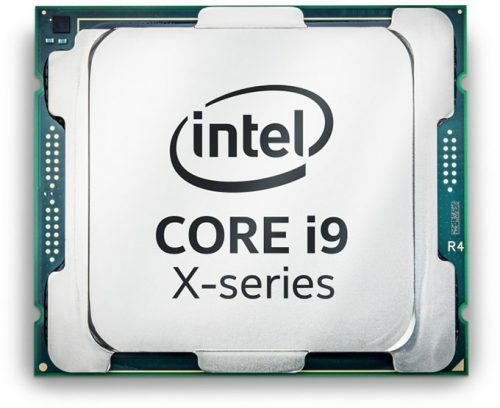 When it’s a Core i9! Intel’s latest and greatest processor, a 10-core chip clocked at 3.3GHz, comes to us in the form of the i9-7900X. Sharing the same 140W TDP of its predecessor, the i7-6950X, the $999 Skylake-X i9-7900X shaves at least $700 off the price, generation to generation, and performs better at the same time, too. Seeing as Intel launched this (and other Core X) chips last month, I couldn’t tell you much here that you probably didn’t already know. I’ll tackle some basics, though, and then dive into a deeper look at the models available from Intel right now. As the table below highlights, Intel’s Core X series is made up of chips built around two different architectures: Skylake-X and Kaby Lake-X. Both architectures are vastly similar, with the latter being the superior (a strong word given the real-world gains, however). A major addition does hit the Skylake-X architecture, though, as Intel has carried over its AVX512 instruction extensions from Xeon Phi to these chips. AVX512 is expected to become available for 10nm Cannonlake mainstream processors, ruling out the chance of seeing it on upcoming 8th gen Core processors, dubbed Coffee Lake. Etc All Core X-Series processors use the LGA2066 socket. Dual-channel chips are Kaby Lake-X. Quad-channel chips are Skylake-X. 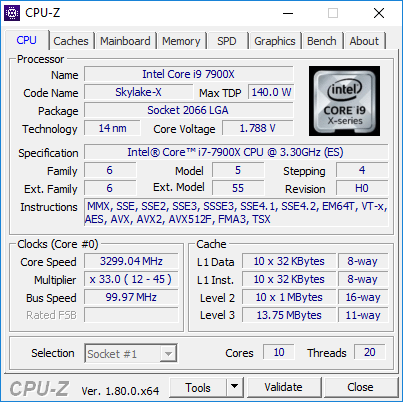 Let’s kick off a look at the i9-7900X with some simple analysis using the table above. The bottom two SKUs in Intel’s Core X lineup are of the Kaby Lake-X variety, meaning they support a dual-channel memory controller, and in the case of these two models in particular, the same TDP is even shared. The same can be said about the Skylake-X parts that rule the top of the currently available CPUs; all three are spec’d at 140W TDP, despite being hugely varied. This all leads me to a couple of complaints, with the biggest one being the fact that I don’t think these bottom-end SKUs should exist. X299 motherboards which complement the Core X series are expensive – starting from at least $300 – which as more than the smallest chip here. And, since those chips include just 16 PCIe lanes, their allure to a gamer is going to be nonexistent. At the same time, I don’t think Intel should have granted a chip like the 7900X an “i9” moniker, because it just doesn’t deserve it. It’s a super powerful chip, there’s no question about that, but so was the i7-6950X. I don’t see how a 300MHz boost to stock clocks (or even 500MHz to Turbo) justifies that kind of branding leap. Before diving into the test results, there are a couple of other things worth talking about. First is the fact that the LGA2066 socket adheres to the same standard as the outgoing LGA2011 one, meaning that all LGA2011 coolers will work on this platform just fine. As long as your cooler supports 140W TDP CPUs, but chances are it will, since LGA2011 was all about the high-end. Below is a shot of the Core i9-7900X installed in what’s become Techgage‘s new workstation GPU test rig, documented in good detail here. 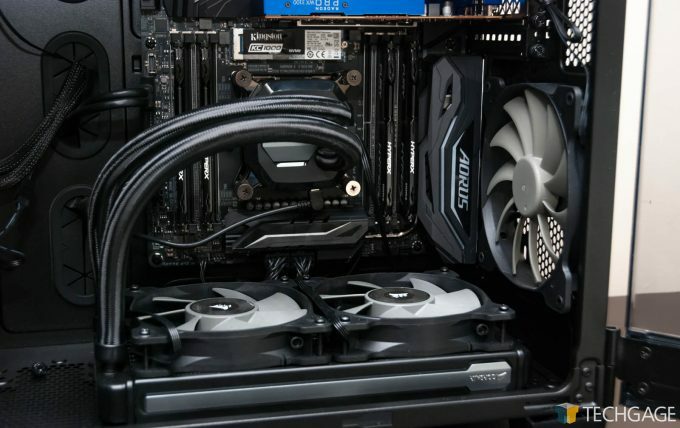 Like our gaming GPU test rig, this build keeps cool with the help of Corsair’s Hydro H100i v2. Now, before I built this rig, I felt that this cooler was a monster – but after? I’m not so sure. That’s as long as we’re talking about overclocking. At stock, this CPU cooler is great, but when overclocking is introduced, it struggles (for reasons explained later). A 10-core chip is just hard to cool, or at least 10-core 140W chips are. On a similar note, one thing you’ll notice in the performance results is that the 7900X is quite a bit faster in some instances than the 6950X, which also offered 20 threads at a similar clock speed. The reason seems to be with regard to how the 7900X handles its Turbo clocks. On the 6950X, a full load will tilt each core to 3.5GHz, whereas on the 7900X, that’s boosted to 4.0GHz. That’s significant. Meanwhile, the peak Turbo speed has also seen a big increase of 500MHz, hitting 4.5GHz in single-threaded operations when other loads are light. At default settings, my i9-7900X Cinebench results align with other trusted reviews, so I feel safe with that verdict. 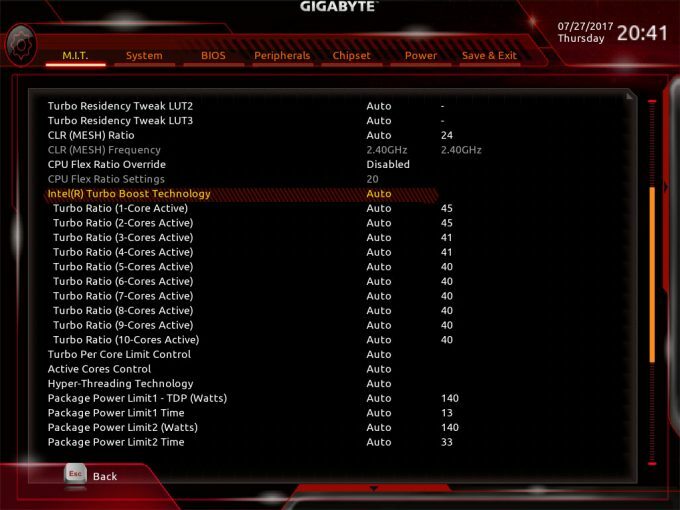 Inside the EFI, GIGABYTE shows that up to two cores can peak at 4.5GHz, while four cores can hit 4.1GHz. That’s a bit odd as Intel shows the max Turbo to be 4.3GHz. Nonetheless, as I suggested above, all 10 cores will peak at 4GHz on the i9-7900X, giving it a 500MHz boost over the i7-6950X. That means more voltage, and thus more power, again proving that the rated TDPs only matter so much (both are 140W TDP parts). 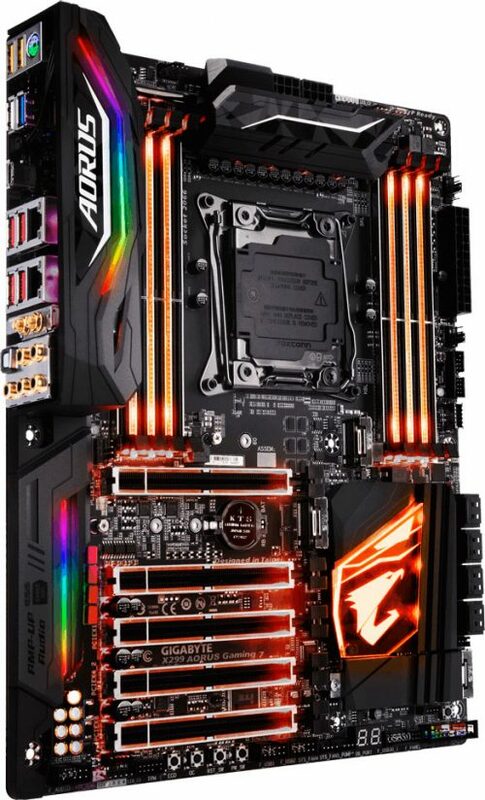 The first X299 board I’ve had the time to explore, is GIGABYTE’s X299 Aorus Gaming 7, as it’s acting as a base inside the aforementioned WS GPU test rig. This board clocks in at $400, which to me is a bit pricey, but less expensive models exist, such as the Gaming 3, at $280. The Gaming 7, as its high number would suggest, is a no excuses motherboard when it comes to features. It’s got bling (read: RGB), and a huge amount of features catering to gamers. I am going to take a deeper look at this board soon, because this doesn’t even cover half of what this board is capable of. So for now, let’s dive into a deeper look at the i9-7900X’s performance, but first, I’d encourage looking over our testing information and methodology on the next page, highlighting the specs of each rig, the tests themselves, and including light info on what guidelines are followed. 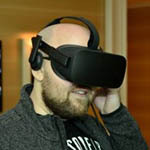 One important thing to note is that the i9-7900X machine has been equipped with the fastest memory used for testing to date, which is because at some point in the future, all platforms should be tested using the same speeds. When Ryzen launched in the spring, the memory situation out-of-the-gate wasn’t great, but it’s improved since. That doesn’t help much for past test results, and time hasn’t allowed retesting up to this point. Nonetheless, a 266MHz gain over Ryzen’s configuration shouldn’t make too grand of a difference outside of the memory tests (or the 400MHz gain over the other Intel tests, for that matter). That covered, time to pack up and move onto the next page.